As part of the 13th International Symposium for Electronic Arts festivities, SRL will be giving a RARE large scale performance in San Jose this August. from CNet with some hilarious misinformation by Declan McCullagh. SRL (SURVIVAL RESEARCH LABORATORIES) presents its first full-bore, no-holds-barred, give 'em all you've got, Bay Area performance in over ten years! SRL shows are rare, and cannot be truly experienced by seeing a film or video... you need to see, hear, smell and feel the cataclysmic spectacle in person - "virtual" doesn't cut it. Some things are purely mythic like Survival Research Labs, which springs from the shell of abandoned buildings, monster robotic history, and fire. An interdisciplinary mash-up like no other, SRL, brings a newly conceived performance to ZeroOne San Jose full of its legendary machines, flame-throwers, and bombastic sound. Humans are only present as audience or operators; in this show it.s all about the machines. As described by founder Mark Pauline, an SRL performance is comprised of .ritualistic interactions between machines, robots, and special effects devices." Whatever else you call it, (and the title won.t be announced until just before the show), we call it big fun, exciting, and something you won.t want to miss. This one is definitely for more than the brainiac crowd . 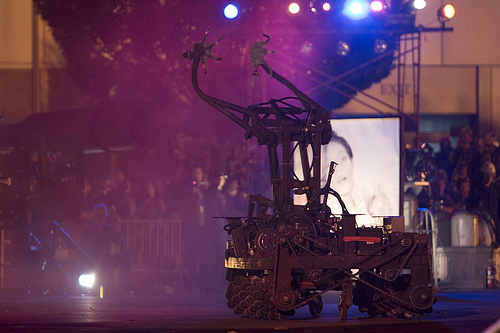 it.s monster machine, meets hovercraft, meets huge sculptural creatures, meets fire. See you there.